It’s so easy and delicious! I’m not sure why I ever bought the pre-made stuff. Tomatoes are ripe and plentiful – it is the perfect time of year to make salsa. So round up all those local tomatoes bursting with juicy flavour. I got a pint of the last harvest of golden blush tomatoes from Hans and Angel at the Charlottetown Farmers’ Market on Wednesday. Almost all of the ingredients for this salsa came from the Charlottetown Farmers’ Market. Salsa is so easy you can really do whatever you want. Add whatever types of tomatoes, onions, and peppers you like. Add as much or as little cilantro as you want. I like to roast tomatoes because it helps reduce their acidity, and I like the consistenc and flavour that comes from roasting. But you can do a delicious raw version of this. You can also do a roughly, hand chopped, chunky version of this, if you prefer that texture. *tailoring the spicy-ness of your salsa depends firstly on the type of hot pepper you use, and secondly on how many you use. If you like a mild heat I recommend using something like anaheim peppers, if you like a mild to medium heat use jalapenos, and if you like to feel the heat use hotter red peppers like fireball or cayenne. Preheat the oven to 400 degreed farenheit. Quarter the large tomatoes, or halve cherry tomatoes, quarter the onions. Carefully halve the hot peppers. (This is the only tedious part of the salsa process… The juice from the peppers can burn your skin! I like to coat my hands with olive oil before chopping – this acts as a protective coating and helps prevent pepper juice burns. It looks silly, but I chop with my head tilted slightly back so as to avoid pepper juice getting in my eyes (safety glasses would probably be a better idea. Use a fork and a knife to handle the peppers, and avoid handling the inside of the pepper, especially the seeds). 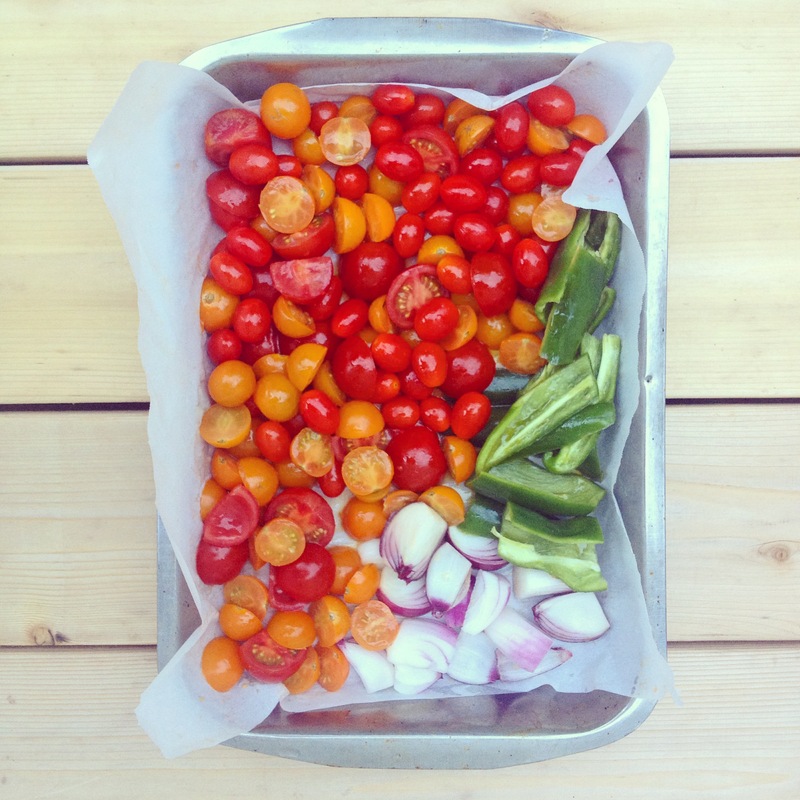 Spread the tomatoes, onions, and peppers onto the parchment lined pan and roast for about 30 minutes. Remove from the oven and let cool. Put everything in a food processor or blender, add the lime juice, cilantro, and salt and pepper, to taste. Notes: If you’re unsure about gauging the spicy-ness of the salsa, hold off adding all the pepper to the puree. Just start by adding half a pepper, puree, taste-test and adjust according to your taste. This recipe is loose, and can be doubled, or tripled. If you got the ingredients and the appetite, go for it! Now enjoy that delicious salsa! Use it (as a dip for nachos, veggies, or as a dressing on eggs, rice, salads) can it, gift it!